When Avengers: Age of Ultron arrives on Blu-ray and DVD, it will come packaged with a gag reel. But guess what? You don't have to wait until October 7th to see it. The full gag reel has found it's way onto the Internet. And it's pretty cute. We get to see Jeremy Renner trying to smother newcomer Aaron Taylor-Johnson while they shoot a very somber moment on set. Cobie Smulders swears a lot. And the rest of the cast make funny faces and goof off during the shoot. There is actually some pretty funny moments here. 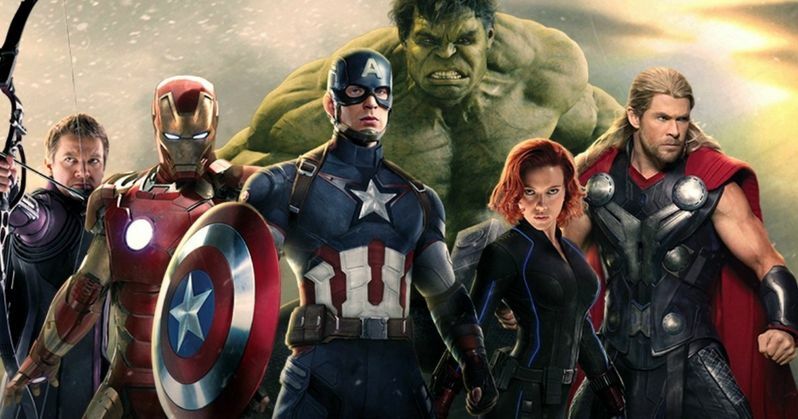 Marvel's Avengers: Age of Ultron is an action-packed adventure that is a must-own, mind-blowing blast! Bring home the year's biggest adventure with exclusive bonus content. The Digital 3D, HD, & SD, 3D Blu-ray Combo Pack, Blu-ray bonus materials include Never-Before-Seen Deleted Scenes, Making-of Featurettes, a Gag Reel and Audio Commentary. the 1-Disc DVD will include a Making-of Featurette. Director Joss Whedon has already revealed that there won't be a director's cut of Avengers: Age of Ultron on the 3D Blu-ray, Blu-ray and DVD release. Marvel announced last week that they are also releasing a Phase 2 Blu-ray Collection, debuting during the holiday season. The 13-disc Marvel Cinematic Universe: Phase Two Collection will include Iron Man 3, Thor: The Dark World, Captain America: The Winter Soldier, Guardians of the Galaxy, Avengers: Age of Ultron and Ant-Man, along with a "top-secret bonus disc." An exact release date has not been give, but it will likely be timed to the Blu-ray and DVD release of Ant-Man. One of the Making Of featurettes is entitled Unlocking the Infinite Six, which deals with the six Infinity Stones and will serve as a preview for Avengers: Infinity War Part 1 and Avengers: Infinity War Part 2, arriving in 2017 and 2019, respectively. Hopefully we'll get to see some footage from this featurette before October. It will certainly make picking up Avengers: Age of Ultron on 3D Blu-ray, Blu-ray and DVD much more exciting! This sequel to the smash-hit comic-book epic The Avengers finds the iconic superhero team dealing with a threat of their own making: a sentient robot called Ultron, who was originally designed as part of a peacekeeping program. Since the events of the last film, Captain America, Iron Man, the Hulk, Thor, Hawkeye, and Black Widow have been working to take down various cells of a secret society of villains known as HYDRA. Their zeal to make the world a better, safer place inspires Tony Stark, genius billionaire and alter ego of Iron Man, to create Ultron in order to respond to additional threats that the Avengers aren't able to handle. Ultron, unfortunately, takes this directive way too seriously, he believes that world peace can only be achieved by exterminating humanity, and he'll stop at nothing to accomplish this goal. The battle between the Avengers and Ultron is further complicated by the appearance of superpowered siblings Quicksilver and Scarlet Witch, who ally themselves with the homicidal android. S.H.I.E.L.D. operatives Nick Fury and Maria Hill also join in on the fun. Joss Whedon, writer and director of the previous Avengers movie, returns in both capacities here. Take a look at this very funny gag reel, where Marvel shows it's funny side.